Igor was fabulous. He has Rick's parts down pat, and now he's starting to add his own tasty embellishments on top of them, including some "Moog" adlibs on HotS and some rockabilly piano on America. He makes you forget about the damage Tony did to these songs during the YesWest years. Chris was the star of the show again. 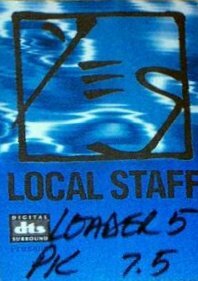 He was overflowing with enthusiasm, playing with so much energy and fire that you'd think he was playing these songs for the very first time. Oh, and the solo has changed a little bit too -- the first half goes just like the live version on Yessongs, and then the second half moves into the typical "Whitefish" rendition. Alan was great as always. I was thrilled to hear that he finally has adopted Bill's hit-the-snare-every-fifth-beat rhythm on LDR...and he had some kind of echo triggered on his drums during the "Eclipse" section of &U&I, which added some nice dramatic effect. I did feel a little sorry for him, though -- the setlist has gotten so retro he's only playing three of his own songs; the rest were done with Bill. That's his reward for giving 26 years of his career to Yes?! The surround show was GREAT...what a dimension to hear Steve's gt and Igor's keys flying at you from behind. I'll miss it if it's not back next time. Well, it was my most enjoyable YES concert yet. All of CTTE, a great light show, beautiful night....perfect! Igor seemed bummed out...played great, but did not seem pleased. Parsons band was workmanlike, boring...Foreigner wannabee's. Great singer, but who cares? Commercials have great singers, too. I'm harsh, here, but that's how I felt. Excuse me, but Chris looked basically drunk! He blew an entrance, for the first obvious musical goofup I've ever heard from them in concert. Sure, he played and sang great, put on a fantastic show, and may have been the life of the party, but I'm concerned for him. Alcoholism is a major rut, and life is better out of that rut, no matter how comfortable or advanced that rut may be. Enough preaching..it's his life. Steve was really intense, and played flawlessly. He just keeps getting better! Alan was powerful and perfect. Jon seems older and wiser, more humble about his role, but still the relayer for hopes, dreams and truths. His voice! I took my two sons, 15 and 11. They really liked it, and now maybe don't think Dad is so weird for liking that "band with the high voice!" 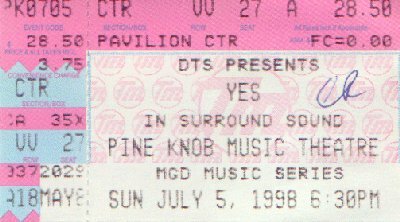 Yes is best in concert, and, for me, a Yes concert is the best concert. Last night they did it again. Thank you YES, long may you rock!